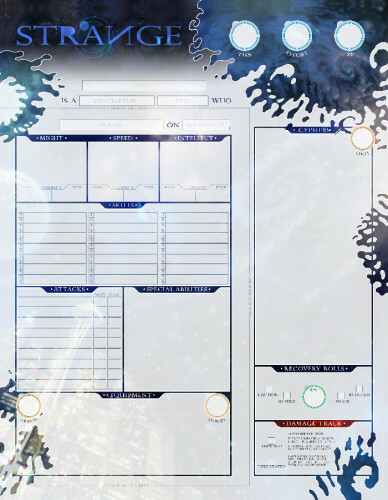 A character sheet is a character sheet�right? Not if it�s The Strange character sheet! The Strange character sheet is as unique and intriguing as the game itself. And it�s available as a really nice pad of printed sheets. Once you use those, you�ll never look at your old laserprinted character sheets the same way again! The pad of double-sided character sheets is printed in full color on heavy matte paper that�s both pencil- and eraser-friendly. You get 20 character sheets�enough for an entire party and several campaigns�and 30 recursion sheets, each double-sided to be used twice. You also get a full-color two-page character generation walk-though�really handy to have at the table when the whole group is making characters!